Riding the well rested back of 2011 AL MVP Justin Verlander, along with 2012 triple crown winner Miguel Cabrera and marquee offseason acqusition Prince Fielder, the Detroit Tigers will take the field Wednesday at AT&T Park in Game 1 of the 108th World Series as the clear Las Vegas favorites, despite having won six fewer games during the regular season than their opponent, the San Francisco Giants. The Giants, who will be playing for their second Series championship in the last three years, get the slight even though they have home field advantage, a distinction earned in no small part because ace Justin Verlander was rocked soundly in the All-Star game (1 IP, 4 H, 2 BB, 5 R), with a large chunk of the damage being inflicted by players wearing the Orange and Black. One thing is shaping up to be certain. Baseball fans are in for a wild ride. The Tigers come into San Francisco having not played a game since last Thursday, when they completed a four-game sweep of the mighty New York Yankees, while the Giants take the field on Wednesday fresh off a dramatic come-from-behind series win over the defending champion St. Louis Cardinals just two days earlier. Whether that added extra rest translates into an advantage is yet to be seen, but three times since the LCS expanded to a best-of-seven format has a team that completed a four-game sweep advanced to face a team that went the full seven. In all three instances, the team with less rest won handily. San Francisco, meanwhile, rolls into the Series overflowing with confidence after winning six straight elimination games this post-season alone, but they’ll run into a buzz-saw named Verlander in Game 1, and he’ll be followed by a group of starters that collectively has posted a 1.02 ERA over the first nine games of the 2012 playoffs. Avila had a strong year defensively, but his offensive numbers were down from his breakout 2011 campaign. He homered in the division series against Oakland, but otherwise has collected just 3 singles in 21 at bats this October. But he works well with his staff, especially Verlander, who had a 2.46 ERA during the regular season with Avila behind the dish, a mark that dropped to 0.74 during the post-season. Meanwhile Posey is the NL Comeback Player of the Year award winner and the likely MVP. Yet aside from one majestic blast against Mat Latos of the Reds, he has struggled at the plate in the playoffs. His performance during the Series could go a long way towards determining who comes out on top. The A’s and Yankees did a good job of keeping Fielder in check during the first two rounds, holding the big fella to just one home run and 7 singles in 41 plate appearances. San Francisco pitchers have had some measure of success against him in the past, allowing only 5 home runs to Fielder in 44 career games, and they’ll need to replicate that success in the Series. After going just 1-for-13 against the Reds, Belt got hot during the NLCS, batting .304 and slugging .565, including going 4-for-9 in the final two games. He’s not in Fielder’s league at the plate, but he held his own against the Cardinals, and he’s got the decided advantage with the glove. Infante came over in the July deal that delivered Anibal Sanchez to the Tigers, and hit .257 with a .668 OPS in 64 games for Detroit, after batting .287 with a .754 OPS in 85 games for Miami. He stepped it up and hit .353 in the division series against Oakland, but had just four singles in 18 at bats against New York. His glove, however, helped solidify the second base position. Scutaro, meanwhile, came to San Francisco in what has turned out to be perhaps the biggest deadline deal of Brian Sabean’s tenure as GM of the Giants. Scutaro hit .362 in 61 regular season games and .354 in his first 12 post-season matches, while collecting 14 hits in the NLCS to tie a championship series record. He also flashed some fancy leather during the series and overcame a hip strain caused by Matt Holliday’s illegal barrel roll slide in Game 1 to win the Most Valuable Player award. Peralta had a sub-par year at the plate, but has turned it up a notch in the playoffs, particularly against the Yankees, against whom he batted .389 with 2 home runs in the four game set. He’s solid in the field according to UZR (9.9), though John Dewan’s +/- rating system doesn’t like him as much (-1 defensive run saved). Crawford, a future Gold Glove winner, hit just .217 against the Cardinals, but drove in five runs and played outstanding defense in a series where defensive miscues at shortstop for St. Louis were a big key to San Francisco’s comeback. After a slow start to his 2012 post-season (.250 in five games vs. Oak), the triple crown winning Cabrera found the Yankees pitching much more to his liking, driving in four runs in the four game set, and slugging .563. The portly Panda, meanwhile, has driven in nine runs in 12 playoff games, with 3 home runs for San Francisco, and despite his girth, is the more fundamentally sound defensive player. Cabrera is the world’s best pure hitter, but Sandoval’s no slouch at the plate himself and his glove work makes the gap smaller than most would credit him for. The Tigers outfield is young – at 27, Delmon Young and rookie Quintin Berry are the oldest of the group – and talented. The speedy Berry was 21-for-21 in stolen bases during the regular season, and 2-for-2 in the playoffs, while the 21-year old Garcia has played in only 23 regular season games, but hit .455 against the Yankees in the ALCS. Jackson, the leader of the group, had his best big league season and hit .353 with a double, a triple and a home run against New York. Where you might see the Giants home field advantage benefit them the most, however, is when the defensively challenged Young is forced to take the field at spacious AT&T Park. Detroit will look to get the lead early in those games, and turn to Dirks or Berry for defense in the later innings. As motivational as his pre-game speeches have been, the Giants will need the Reverend Hunter Pence to produce a bit more at the plate in the Series, though some might suggest that divine intervention was involved with his thrice struck, broken bat, backspin loaded, three-run double in Game 7 of the NLCS. Blanco and Pagan, both garnering their first major league post-season experience, have covered a lot of ground in the outfield, but the Giants would surely benefit from the two speedsters reaching base more often during the Series. Pagan did have three multi-hit games in the NLCS and could be primed to break out big in his first World Series. Verlander, the best pitcher in the universe, is followed in the rotation by Fister in Game 2, Sanchez in Game 3, and Scherzer in Game 4. That foursome allowed just 35 hits in 62 innings of work in the first two rounds of post-season play, holding hitters to a .162 batting average, and they represent the Tigers best hope for their first World Series title since 1984. Verlander matches up against Zito, who pitched the game of his Giants career (7.2 IP, 0 R) in St. Louis in Game 5 of the NLCS, after getting just 8 outs against the Reds in the NLDS. 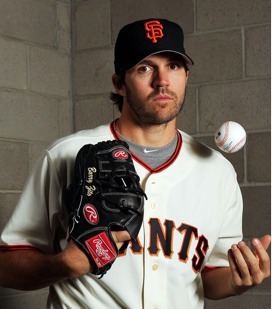 The Giants have won 13 straight starts by Zito, however, and view him as their lucky charm. San Francisco will hope Bumgarner has indeed worked out the flaws in his delivery, or you will see their wild card, two-time Cy Young winner Tim Lincecum, out of the bullpen early. The best-pitched game of the Series may just end up being Game 3, when Vogelsong faces off against Sanchez. Sanchez, acquired from Miami in July, has a 1.98 career ERA in five starts against the Giants, while Vogelsong has allowed just 4 earned runs over his last 36 innings (1.00 ERA) dating back to September 21. Those two could potentially meet up again in a Game 7 at AT&T, where Sanchez sports a nifty 0.36 ERA in 3 starts. Max Scherzer, whose 11.1 K/9 lead the majors, duels Giants ace Matt Cain in Game 4. The biggest question of the Series is who will close out games for Detroit? Tigers skipper Jim Leyland said during the ALCS that Valverde was still his closer, but that he wouldn’t use him to close out any more games during that series after Valverde imploded in the ninth inning of Game 1. Lefty Phil Coke did well against the Yankees, picking up 2 saves, while top setup man Joaquin Benoit is vulnerable to the long-ball, after having surrendered 14 during the regular season and another in the post-season, so it figures Coke would be used ahead of Benoit, if Valverde is not up to the task. Aside from Valverde, however, the Tigers pen has done a fantastic job, allowing just 2 earned runs (both by Benoit) in 18 1/3 innings (0.98 ERA). Bruce Bochy continued to use his bullpen masterfully against the Cardinals, and has seen his group of relievers post a 2.57 ERA this post-season. Tim Lincecum remains the Giants versatile secret weapon out of the pen, while Romo, Casilla, Lopez and Affeldt have been lights out in the late innings. The Tigers 83-year old owner Mike Ilitch has four Stanley Cup titles in the last 15 years, thanks to his Detroit Red Wings, but it’s a World Series ring that eludes him, and it’s that want of a ring that drove him to spend $214 million on Fielder this past winter. GM Dave Dombrowski has built a team deep in pitching and in hitting. If they have an exploitable weakness, it’s their defense, which ranked among the worst in the majors in 2012, and in the post-season, every mistake is amplified. This series will likely come down to who makes the fewest mistakes, and who comes up with the biggest and the timeliest clutch hits. You can bet there will be plenty of great pitching to go around. For me, however, this World Series will come down to who wants it the most. Judging from how they refused to quit when facing elimination six straight times, that’s got to be the Giants.